Beautiful and distinct this Mad Hatter design is nothing short of brilliant! Our Alice in Wonderland design is our tribute to the classic tale of magic and mystery and features a render of the wild and wacky Mad Hatter in a very unique pop art typography style. 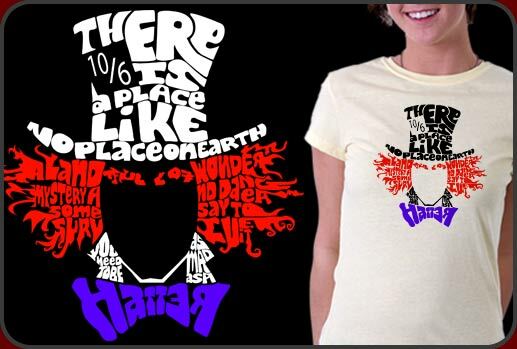 Alice in Wonderland shirt quotes a favorite line in the film, "There is a place like no place on earth. A land full of wonder, mystery and danger. Some say to survive it you need to be as mad as a Hatter." Our Alice in Wonderland shirt renders the likeness of the Mad Hatter with incredible typography in word art fashion. We created two styles so that you can have your choice of light or dark shirts and we have lots of cool Alice in Wonderland shirt styles available for men, women and children as well.